I recently drove across Massachusetts to get a creativity infusion! My first stop was the Eric Carle Museum of Picture Book Art in Amherst, MA, just up the road from North Hampton, which is a favorite college town of mine filled with shops and galleries displaying arts, crafts, and generally has a strong creative vibe. 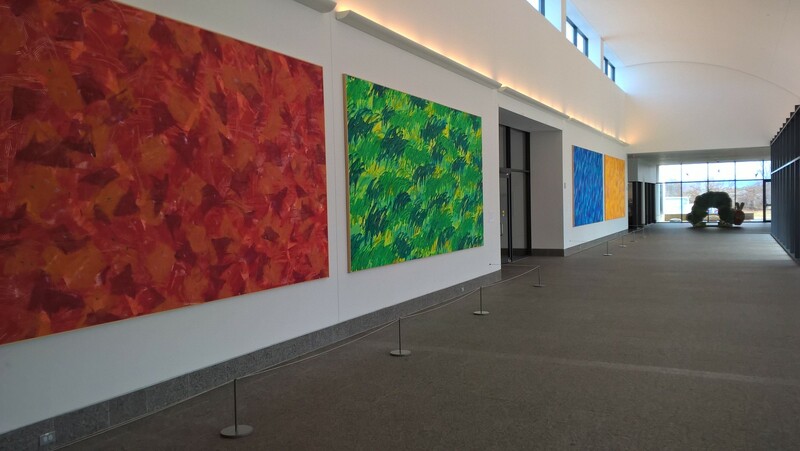 The “Eric Carle and Friends: What’s Your Favorite Color?” exhibit (up through August 27, 2017) was an opportunity to look closely at original work and deconstruct the creative process of Carle and other artists. I could study brush strokes, edges, and various media, and was fortunate to have a friend with me so we could talk about our preferences and ideas about process and resulting art. What makes an engaging illustration? Eric Carle’s method of first creating color on paper in broad strokes, blending hues, and then cutting out shapes from that paper, present a pleasing combination of unpredictable and precise. The balance of scattered color contained in a shape surrounded by white space gives the viewer a visual puzzle, but a resting spot for the eyes. It’s complex, but has order and structure, so isn’t so visually busy that it pushes viewers away. His work invites the viewer in to explore and learn more. 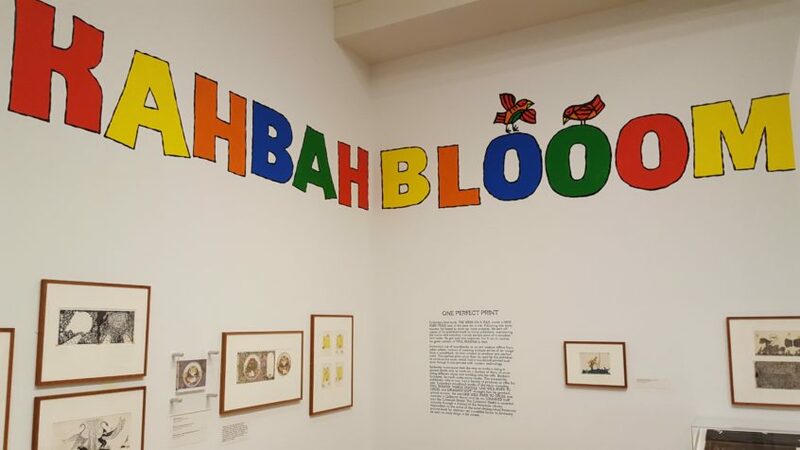 In this exhibit, one wall was painted in stripes of color and for each displayed words that described what the emotion and images that color evoked. Purple for royalty, power, wisdom, spirituality, and luxury; Blue: calm, loyalty, peace, sincerity, trust; Green: balance, envy, renewal, harmony, nature; Yellow: warmth, happiness, joy; Orange: optimism courage; Red: strength, love, danger, passion. 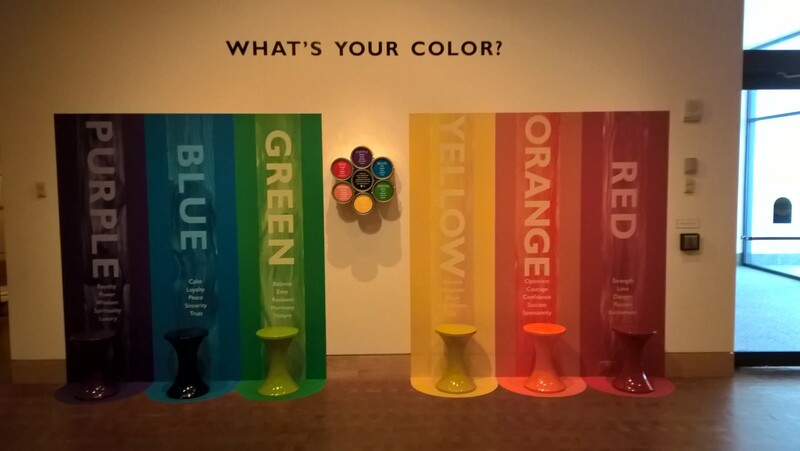 Who decided what each color represented? I know that in other cultures, colors have other meanings. For me I think my experience at a time and place in my life and the color that was there, give me the feeling for that color. Green is serene to me because it embodies the natural world where I live, but if I lived in the Southwest US, where the natural world is orange and reds, maybe those colors would represent serenity. It’s curious to think about! At his website you can see how Emberley tries new techniques all the time, so his work is always changing and evolving. “Ed Emberley’s Drawing Book of Animals” was a favorite of mine when I was in elementary school. I loved the recipe of shapes he had for each animal. Large circle + small circle + the letter S + a square = an animal! It was so simple. 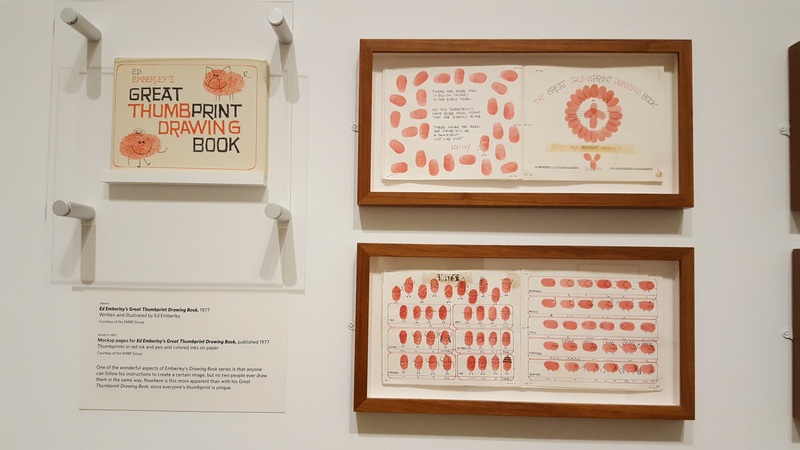 He also showed how to make thumbprint art and I used his instructions to make some animals that I submitted to the Christian Science Monitor (my grandmother’s favorite newspaper) and I was accepted! My first artwork in print! I can’t even imaging how many children were empowered by Emberley’s drawing recipes and drew their own animals, buildings, aliens, and entire worlds of structures and creatures! What a gift! Emberley created many more books –some wildly popular, and others not. I am inspired by this artist’s determination to create and grow. 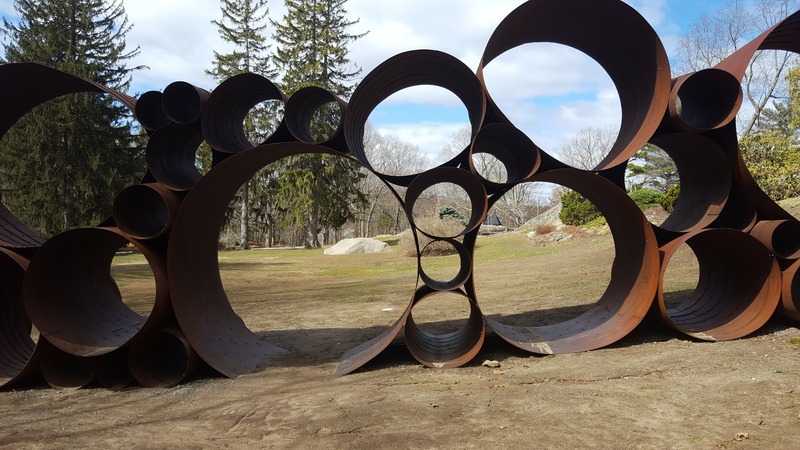 I also visited the deCordova Sculpture Park and Museum in Lincoln, MA and enjoyed the permanent collection of contemporary sculpture and a special exhibit of abstract paintings created by New England women from the 1950’s to present day. 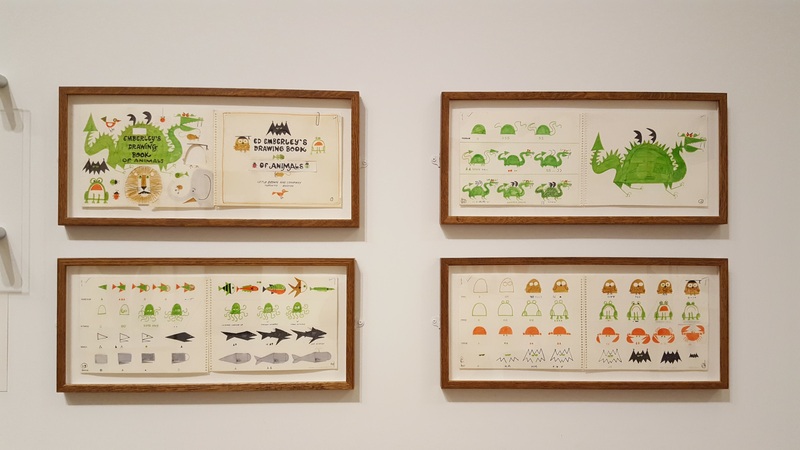 Although a far cry from children’s book illustrations, these pieces of art gave me more to think about. Considering the passion behind a work of art is endlessly fascinating to me. What motivates the artist to put colors together in this pattern or represent a figure? What drives an artist to spend the time and dedication to bring a 3-D piece of artwork into existence? Filled up on ideas for now–Time to create some work of my own!